At Bonsai Boy, online at Bonsai Boy, find Bonsai Trees and accessories. Bonsai Boys offers trees for under $30, accessories, Junipers, indoor trees, flowering and much more. Bonsai Trees make great gifts and it’s an excellent way to be eco-friendly. Bonsai Boy offers all sorts of valuable tips to grow these trees and all the tools and accessories you need to do so. If you don’t have time to take care of a growing Bonsai Tree you’ll even find artificial trees. So check out Bonsai Boys but remember RetailSteal has the best Bonsai Tree coupon codes, Bonsai Tree discounts, Bonsai Tree promotions. Bonsai Trees ships to the 48 contiguous US states. Bonsai Trees also ships to Alaska, Hawaii, Puerto Rico, and US Virgin Islands for additional fees. Bonsai Trees does not ship internationally. Next Day shipping is available. See website for full details, exclusions may apply. Shop for Bonsai trees and accessories at Bonsai Boy and save 12% when you enter this coupon code at checkout. Buy 3 trees from Bonsai boy and use this coupon code to save 10% on your order. Click to save. At Bonsai Boy get free shipping on select overstock items. Purchase Bonsai trees for under $30 from Bonsai Boy. Buy a Pre Bonsai Juniper Bonsai Tree-Small at Bonsai Boy for only $8.95. Click link to purchase. At Bonsai Boy, buy a bonsai tree for only $29.95 when you shop online. Click link to purchase. Use our coupon code at Bonsai Boy online today to receive a 5% discount on purchases. 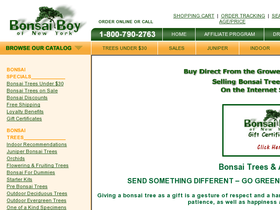 Save 10% on your live tree purchase from Bonsai Boy of New York when you use this promo code! Enjoy free shipping on your Bonsai Boy purchase when you enter this promo code at checkout! Use our coupon code at Bonsai Boy online to get a 20% discount on purchases. Click link.